The photo on the left shows the rapidly eroding sand dunes—essentially glacial till—near Eastham, Cape Cod, Mass. The houses are in an increasingly precarious position! On the right is a view of the coastal sand dunes near Provincetown, Cape Cod, Mass, taken from the National Park visitor center. They are partly vegetated, and so are relatively stable (unlike the Eastham dunes). Photos: Andrew Carleton. Penn State students, faculty and staff, as well as local community members (ages 18 and older) are encouraged to attend a free bike safety workshop on Thursday, Sept. 28 from 3:00 to 5:00 p.m. at 117 Weston Community Center at Penn State’s White Course Apartments.All participants must bring a bike and helmet to participate. Participants will receive a free pair of Penn State bike lights. The AAG is currently seeking panelists, workshop facilitators, career mentors, and presenters encompassing a wide range of professional backgrounds, interests, and experiences to participate in careers and professional development outreach during the 2018 Annual Meeting in New Orleans. To present in one of these sessions, please submit your abstract at annualmeeting.aag.org. When you receive confirmation of a successful abstract submission, please then forward this confirmation to: careers@aag.org. The abstract deadline is October 25, 2017. The 2011 Fukushima-Daiichi nuclear accident resulted in a series of controlled and accidental releases of radioactive Cesium in the environment. The citizen science Safecast project was started immediately after the accident to map radiation using off the shelf instruments, and generated over 60 million observations since April 2011. A robust methodology is presented to calibrate contributed Safecast radiation measurements acquired between 2011 and 2016 in the Fukushima prefecture of Japan. The Safecast data are calibrated using official observations acquired by the U.S. Department of Energy at the time of the 2011 Fukushima Daiichi power plant nuclear accident. Addressing environmental concerns, enriching a wide range of majors and making an impact in the community — those are some of the benefits the Environmental Inquiry (ENVI) minor offers, according to Larry Gorenflo, faculty-in-charge of ENVI and professor of landscape architecture and geography at Penn State. The minor recently launched a new website. A number of U.S. universities are embroiled in debates over the long-time commemoration and valorization of white supremacy through the campus landscape. Recognizing place naming as a legitimate political arena, activists have called for—and in some instances succeeded—in removing from university buildings the names of historical figures shrouded in racial controversy. However, for the broader public and even sympathetic higher education officials, there is a lack of understanding about why these demands are important and even less recognition about the violence that racially insensitive place naming inflicts on the belonging of marginalized groups. Instead, the renaming of campus landscapes is understood as merely an act of political correctness and thus campus authorities have offered uneven and incomplete solutions in the name of progressive reform. Applying recent innovations in race and memory studies, specifically the ideas of “wounded” places and “memory-work,” we situate ongoing university place naming controversies in a critical context. Specifically, we build upon the recent work of law scholar Stephen Clowney and discuss the opportunities and challenges of developing a policy of landscape fairness that recognizes the power of place to transmit ideas about racial power across generations and the right of critics to challenge dominant historical narratives. Most atmospheric models, including the Weather Research and Forecasting (WRF) model, use a spherical geographic coordinate system to internally represent input data and perform computations. However, most geographic information system (GIS) input data used by the models are based on a spheroid datum because it better represents the actual geometry of the earth. WRF and other atmospheric models use these GIS input layers as if they were in a spherical coordinate system without accounting for the difference in datum. When GIS layers are not properly reprojected, latitudinal errors of up to 21 km in the midlatitudes are introduced. Recent studies have suggested that for very high-resolution applications, the difference in datum in the GIS input data (e.g., terrain land use, orography) should be taken into account. However, the magnitude of errors introduced by the difference in coordinate systems remains unclear. This research quantiﬁes the effect of using a spherical vs. a spheroid datum for the input GIS layers used by WRF to study greenhouse gas transport and dispersion in northeast Pennsylvania. By Oprean D., Wallgrün J.O., Pinto Duarte J.M., Verniz D., Zhao J., Klippel A. We present our work on creating and assessing virtual field trip experiences using different VR and AR setups. In comparative studies, we address the question of how different settings and technologies compare regarding their ability to convey different kinds of spatial information and to foster spatial learning. We focus on a case study on an informal settlement in Rio, Brazil, in which we used an informal assessment to help inform and improve the design of different VR site experiences. Immersive technologies have the potential to significantly improve and disruptively change the future of education and research. The representational opportunities and characteristics of immersive technologies are so unique that only the recent development in mass access fostered by heavy industry investments will allow for a large-scale assessment of the prospects. To further our understanding, this paper describes a project that aims at creating a comprehensive suite of immersive applications for archeological sites, including 360∘ immersive tours, skywalks, and self-guided explorations for education, and immersive workbenches for researchers. 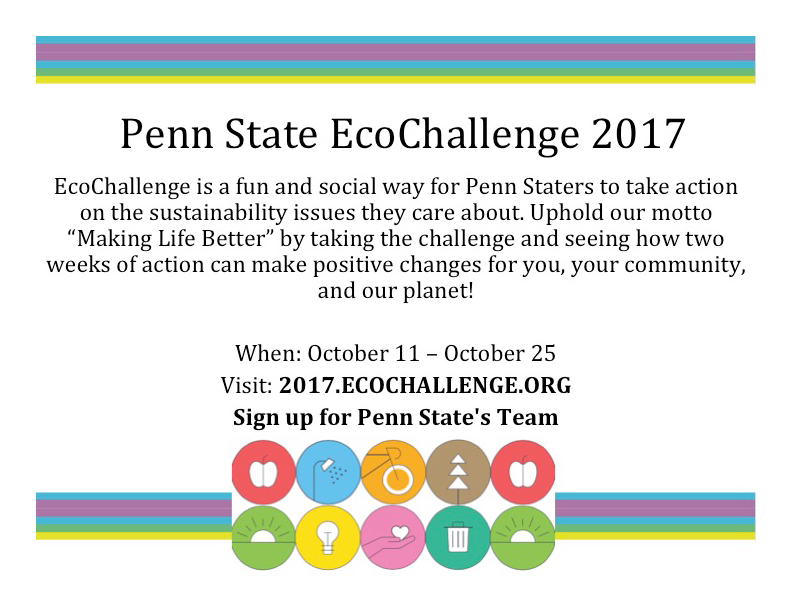 The Sustainability Institute at Penn State is piloting a new program called EcoChallenge to choose actions to reduce your impact. You pick your own challenge and set a goal that stretches your comfort zone and makes a difference for you, your community, and the planet. Challenges encompass a variety of eco-issues such as waste, food, health, transportation, energy, water, and nature, and range in difficulty. For example, one challenge could be using a reusable water bottle each day, while another challenge could be carrying your trash that you accumulate throughout the duration of the challenge. Kelsey Brain has been awarded a Fulbright-Hayes Fellowship for her dissertation research in Costa Rica. Mikael Hiestand and Andrew Yoder passed their FAA Section 107 Pilots exam this week and are now able to legally fly small unmanned systems under Section 107 rules. The Penn State Critical Geographies Conference abstract deadline has been extended to Monday, September 25. The thought of translating fundamental research into a commercial product can appear mysterious and daunting to many in the research and academic community. However, there is a process, with multiple pathways, that can be followed to increase the chances of success. These paths are lumpy, not linear. But by creating and investigating “Business Models” (not a “Business Plan”), researchers can get a better idea on whether there is actually a commercial need for their proposed product/service. This process is currently being implemented at the national level thru I-Corps programming at NSF and NIH, as well as by the 68 teams in the past five years in our TechCelerator@StateCollege Entrepreneurial boot camps. Today’s talk will outline several ways to get started, including an overview of licensing, funding options, prototyping, team formation, and customer discovery techniques. On Monday, August 28, the advisory board for the Penn State Online Geospatial Education program held its annual meeting. Each year, the board evaluates the MGIS degree and GIS, GEOINT, and Remote Sensing certificate programs. Members provide advice and insight on how we can continually refine our classes and programs to anticipate the needs of geospatial professionals and society. Members of the Advisory Board include senior leaders from Esri, CARTO, the National Geospatial-Intelligence Agency, eMap International, 18F, and Azavea, as well as from academic units within and outside of Penn State. Several board members are alumni of the Department of Geography and our online programs, ensuring that we have the voices of our students as well as their potential employers in mind. At the 2017 meeting, board members reviewed course content with faculty and made suggestions on how to build upon the program’s strengths. Engagement with the board enhances our ability to respond to continuing changes in the geospatial professional landscape. In the year ahead we will be redesigning our core GIS Certificate courses based in part on Advisory Board recommendations. SensePlace3 (SP3) is a geovisual analytics framework and web application that supports overview + detail analysis of social media, focusing on extracting meaningful information from the Twitterverse. SP3 leverages social media related to crisis events. It differs from most existing systems by enabling an analyst to obtain place-relevant information from tweets that have implicit as well as explicit geography. Specifically, SP3 includes not just the ability to utilize the explicit geography of geolocated tweets but also analyze implicit geography by recognizing and geolocating references in both tweet text, which indicates locations tweeted about, and in Twitter profiles, which indicates locations affiliated with users. Key features of SP3 reported here include flexible search and filtering capabilities to support information foraging; an ingest, processing, and indexing pipeline that produces near real-time access for big streaming data; and a novel strategy for implementing a web-based multi-view visual interface with dynamic linking of entities across views. The SP3 system architecture was designed to support crisis management applications, but its design flexibility makes it easily adaptable to other domains. We also report on a user study that provided input to SP3 interface design and suggests next steps for effective spatiotemporal analytics using social media sources. In this article, we present the GeoCorpora corpus building framework and software tools as well as a geo-annotated Twitter corpus built with these tools to foster research and development in the areas of microblog/Twitter geoparsing and geographic information retrieval. The developed framework employs crowdsourcing and geovisual analytics to support the construction of large corpora of text in which the mentioned location entities are identified and geolocated to toponyms in existing geographical gazetteers. We describe how the approach has been applied to build a corpus of geo-annotated tweets that will be made freely available to the research community alongside this article to support the evaluation, comparison and training of geoparsers. Additionally, we report lessons learned related to corpus construction for geoparsing as well as insights about the notions of place and natural spatial language that we derive from application of the framework to building this corpus. Two ChoroPhronesis papers have been accepted to the Immersive Analytics 2017 workshop at IEEE VIS conference in Phoenix, Arizona on October 1st! These are peer-reviewed conference papers, and we will update with the DOI’s once they are assigned. The first paper is “Take a Walk: Evaluating Movement Types for Data Visualization in Immersive Virtual Reality” by Mark Simpson, Jiayan Zhao, and Alexander Klippel, which concerns a pilot experiment testing the effect different types of movement in virtual environments on interpreting 3D data visualizations. Mark will be presenting the paper at the workshop in person. Penn State’s Online Geospatial Education Advisory Board met at The Nittany Lion Inn on August 28. The board provides an annual evaluation of the MGIS degree and our geospatial education certificate programs. The Advisory Board also provides strategic advice on how the programs can best respond to the needs of geospatial professionals and society. Jennifer Baka’s son, Theodore Henry Baka Lewellen, pictured at right, was born on September 7. Sam Stehle successfully defended his dissertation on August 17. He started his post-doc at Maynooth University near Dublin, Ireland. Alumnus Mark Read assumed duties as the Head of the Department of Geography and Environmental Engineering, one of the 13 academic departments here at the U.S. Military Academy. Cindy Zook will be at Pop Up Ave on Saturday, September 23, selling her handmade Goat’s Milk Soap, Super Concentrated Body Butter, and a few Fair Trade African Baskets. We enjoy hearing from our talented students in the Penn State Online Geospatial Program, especially about what they have learned from our classes and how they plan to apply their certificate/degree. Chief Warrant Officer 3 Augustus Wright, from Fort Leonard Wood, Missouri, entered our program in 2015 and just earned his MGIS degree this past Spring. For his capstone project, he studied machine learning algorithms and their applications to geospatial technology (a more detailed summary of his project is at the end of this note). Chief Wright has served three combat deployments to Iraq and earned two Bronze Star Medals, among several other awards. We are proud of him and all of the veteran and current military students in our program. Robert Brooks, Ruby S. and E. Willard Miller Professor of Geography and Ecology and director of Riparia, was elected a Fellow of the Society of Wetland Scientists, the society’s highest honor, during a ceremony in San Juan, Puerto Rico, in June. Brooks is a nationally recognized leader in wetland science and policy with more than 35 years of experience in education and research related to inland freshwater wetlands and riverine ecosystems. Herbivores can profoundly influence plant species assembly, including plant invasion, and resulting community composition. Population increases of native herbivores, e.g., white-tailed deer (Odocoileus virginianus), combined with burgeoning plant invasions raise concerns for native plant diversity and forest regeneration. While individual researchers typically test for the impact of deer on plant invasion at a few sites, the overarching influence of deer on plant invasion across regional scales is unclear. We tested the effects of deer on the abundance and diversity of introduced and native herbaceous and woody plants across 23 white-tailed deer research sites distributed across the east central and northeastern United States and representing a wide range of deer densities and invasive plant abundance and identity. 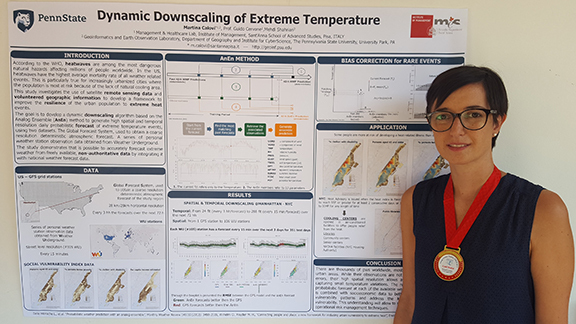 Martina Calovi, who is a visiting scholar with the Geoinformatics and Earth Observation (GEO) Laboratory, won the gold prize paper award in the Young Scientists Session at the Conference of the International Society for Integrated Disaster Risk Management, Reykjavik, Iceland, in August. Frank Boscoe (’00g) was interviewed for the AAG career profiles page (second from the top). esri moocs offered: mapping mooc runs September 6–October 3; imagery mooc runs September 6–October 17. Alex Klippel’s ChoroPhronesis lab was profiled in an article about virtual reality on POB online. Resilience is about complexity, change, and coping with uncertainty. It depends on a deep understanding of intertwined socio-ecological systems. However, uncertainty and complexity in both socio-ecological systems increasingly hinders decision-making. New knowledges and ontologies are needed to transform society for a mature Anthropocene. Using case studies from Ghana, South Africa, and the Menominee Nation (Wisconsin), Erica Smithwick will explore how biosphere stewardship can be enhanced through transformative research and education approaches that embrace interdisciplinary and cross-cultural ways of knowing. The Department of Geography at The Pennsylvania State University invites applicants for a tenure track human geography faculty position in Urbanization at the assistant professor level. We seek a candidate whose research analyzes and addresses the global challenges of urbanization, including topics such as urban social inequality, urban political mobilization and conflict, urban planning in the 21st century, or the challenges of urban sustainability. We encourage applicants who use a range of methodological approaches and scales of analysis, and who have the potential and desire to collaborate with colleagues across disciplines engaged in understanding the fundamental reshaping of physical and human environments brought by urbanization.